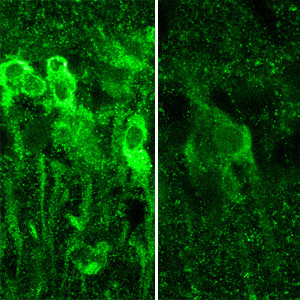 Image: The neon green (left) is showing steroids produced by the neurons, which inhibit the formation of memory, in response to the alcohol. On the right: the same region, minus the booze. Researchers have found the neurons affected by drinking are in the hippocampus and other areas of higher cognitive functioning and the “molecular mechanism that appears to underlie blackouts”. The idea is kinda of domino effect: you drink, the alcohol triggers your neurons to produce a steroid that “inhibits long-term potentiation (LTP), a process that strengthens the connections between neurons and is crucial to learning and memory”. And when just the right amount of this steroid is released, it interferes with synaptic plasticity or memory formation, so you aren’t passed out, your still processing info, your just not able to remember it & have no idea what happened last night or who that is…and there’s your 20’s. Kidding. But the same thing applies with stress in the hippocampus, which may be why our memory of stressful or traumatic situations may be fuzzy/impaired as well. But back to drinking, the brain cells aren’t dead -a little good news there, hmm? The receptors are just “blocking the neural signals that create memories”. The more we know about what happens when memory is inhibited in various ways, the closer we get to “ strategies to improve memory”. You can drink to that.